This weekend saw something truly spectacular, at least from my perspective. A crew of mostly women officiated a Division II football game this past weekend while we were watching Ohio beat up on Miami. I love that. It’s not something I would have expected when browsing news for women in college athletics, but it happened and I’m happy that it did. I will admit that I don’t know everything there is to know about football, but I know that there are women out there who do. I know there are women who were taught by their fathers—and maybe even their mothers—how the game is played and all of the ins and outs. I’ve written before about why women belong in the college football realm when Condoleezza Rice was named to the committee for the new college football playoff system a few weeks ago. That was a huge step forward for women in not only football, but also athletics in general. Photo by AP Photo/Dave Martin. This puts women right down on the field alongside the men playing the game in a role very crucial to the flow and play of the game. What I want to see though, is for things like this to not be news someday. The firsts have to start rolling in somewhere and once they do, they shouldn’t stop. One point I want to stress though, is that a woman should never be placed in a job just to have a woman there to make the team, organization or sport look good. Qualifications will always be the most important part in all of this. I was so often told a few years ago as a senior in high school that I would have an advantage getting a job in the sports industry because I’m a woman. If I work hard and have the skills and qualifications for that job over all of the other applicants, then sure, I’d love to have it, but I will never want a job because handed to me because I’m a woman. And I don’t think women should be reporting on games, on committees or officiating games if they’re not qualified, but if they are, then their gender should never be standing in the way, they should be in the booth, on the committees and on the field right alongside the men. In the case of the game this past week between Lane College and Miles College of the Southern Intercollegiate Athletic Conference, I believe those women were plenty qualified. “They’ve done what’s necessary to get in this position. They’ve earned it. And I’m hoping it will show the world that females can officiate just as well as men, and I’m hoping that more females will take the step to try to become football officials,” Harold Mitchell said of the four women. Mitchell is the director of officiating for the SIAC and SWAC. He noted that the group of women had paid their dues. Further, David Coleman, the NFL’s director of officiating, said that he’d like to see more women officiating the game on the big stage and explained that there are programs in place to make that a reality someday with the Women Officiating Now effort. Now that is progress. 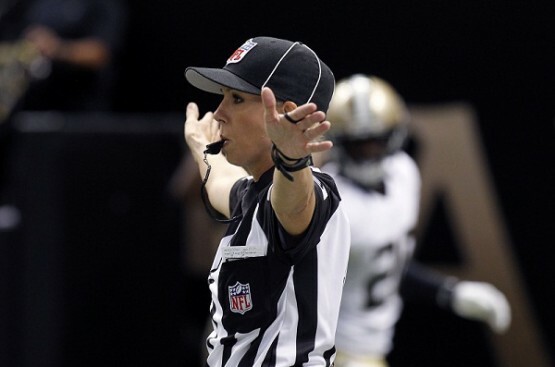 No woman has ever taken on the role of a permanent official in the NFL. Soon though, that could change if Sarah Thomas, one of 21 in the top tier of the NFL training pool can break onto the scene like so many hope she can. With that, another first will be out of the way. And maybe there will be emphasis on a potential second or third, but my hope is that someday, none of this stuff, whether in football or elsewhere, women aren’t breaking down barriers because they’ve already shattered. My hope is that no one ever has to say that a woman is “doing a good job for a woman,” but instead that she’s doing a good job—plain and simple. Right now, especially in sports, women are new to the scene and considered an oddity, but I hope that someday, gender won’t be a focus. The Girl in the Pressbox: The Sports Chromosome?